THE NATURAL HAVEN: Trimming, Hair Growth and Terminal Length!! Trimming, Hair Growth and Terminal Length!! Jess has asked many questions that I'm certain plenty of you want to know the answers to. Thankyou Jess!! Jess: How often should naturals get their hair trimmed when trying to grow ones hair? 1. Search and destroy - Where you sit in bright light with a mirror and look at every strand. This works better if you have longer hair as you do need to be able to pull the hair from everywhere including the middle of your head and the back. 2. 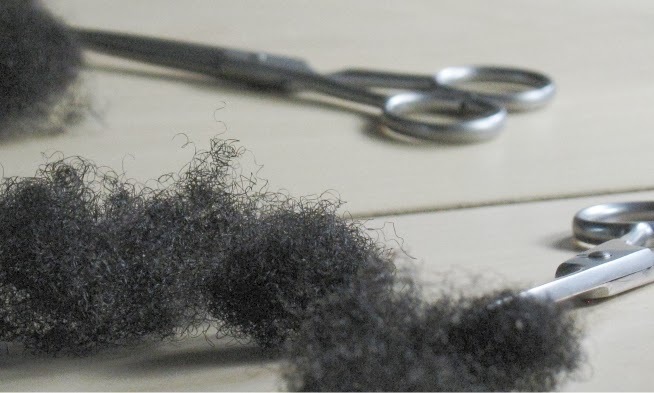 Trim a set amount - Decide on the length, maybe half an inch or quarter of an inch every 4 months or so. Taking a little off every so often will mean you keep most of the length throughout the hair. I would recommend reading this post by Leslie over at Naturally Leslie, she even has recommended videos! Jess: I find it hard to tell when I have split ends as a natural vs. when its was relaxed. Split ends are split ends are split ends. They do not look any different on curly hair. When you have one you can see it. The hair has a forked end. Many of us confuse thinning ends for split ends and this is why with relaxed hair we often chopped off the see through parts of the hair. These are not necessarily split ends, in some cases they could be ends that split already and hence the hair is thinner but not always, it could just be the hair tip becoming thinner due to normal wear. Jess: Also my hair seems grow up to the same length and stops is this it or is it me? Yes hair has its terminal length. Supposing we take the low average, hair grows about half an inch a month and will do so in general for upto 3 years. This means 6 inches a year and a terminal length of 18 inches. In reality this is not the case for everyone. African hair is thought to grow slower (British Journal of Dermatology, pg 294-297, August 2001). I really don't think the study that showed this is great as it was based on only 38 people however even taking this lower measure of approximately 5 inches a year, a terminal length of 15 inches is possible in 3 years. There are many factors that stop curly hair from attaining its terminal length. This is especially true for African hair. It can break much easier, it has a tendency to be dry and combing can be the equivalent of a hair cut. We owe a huge debt of gratitude to Nonhlanhla Khumalo for doing this research - If you are a glutton for more info, see these links here and here. However, the natural hair community has brought out a lot of long haired ladies to the front showing that low manipulation is the way forward and long natural hair is attainable. For this you will have to search for the ultimate archive that is BGLH. I now say that your hair is as long as the skills you have acquired. You can try many things to try and get your hair to show you its terminal length. 1. Be Patient, you will hardly notice half an inch of hair, but you could possibly notice 3 inches. 2. Be realistic, measuring your hair with your longest strand when there are many more shorter strands further up will skew your judgement. That long strand may well break off and the shorter strands are probably the better measure. 3. Be aware of breakage. The curlier the hair, the more gentle the handling. 4. When you appear stuck at one length for a long time (about a year or so), it is time to try a hair cut. Chop off 1-2 inches off. You will cut off the oldest ends allowing your hair to possibly grow longer over time as the ends of the hair have more cuticle layers and therefore less likely to split (Journal of the Society of Cosmetic Chemists, pg 155-75, 1975.). 5. Leave the hair alone. Stop touching it, fluffing it, pulling it (meaning stop damaging your cuticle). Minimise the amount of combing you do and do it in the least damaging way possible - hint hint. Great tips!! Man I haven't trimmed or cut my hair in....almost two years!! I was afraid to be back at a TWA if I ever got scissors in my hand. Jaded you always make me laugh! So does this mean that after someone reaches a terminal length in 3 years that there is a resting period where the hair does not grow and then hair growth recommences for another 3 years? Is this how women with more than 15-18 inches grow their hair that long? After the active growth cycle (anagen), hair goes into a phase where a new hair is made in the follicle. This is the catagen phase. At this point the focus is now put on the new hair and this phase marks the end of the active growth cycle of the previous hair. After catagen, hair goes into a rest cycle where it is no longer growing, just waiting to be pushed out (shed) by the emergence of the new hair. This is the telogen phase. Women who have more than 18 inches of hair have either more than average hair growth rates (more than 6 inches a year) or more than average anagen cycles. Waist length hair for example is often thought to have been growing for 5 years. The average growth cycle is thought to be 3-5 years so my calculations are on the basis of the low end - 3 years. That's such a clear and informative answer. Thanks, JC! Hope your vacation is restful and inspiring. I'm impatient so waiting for my hair to grow can be really difficult. Thanks for the comment and letting us in on your experience. I do think being gentle is really important and it is probably not spoken of enough. Hi I'm new to your blog so forgive me if you have answered this question previously, but is there such a thing as trimming your hair according to the moon? My grandmother said if you cut your hair during a certain time of year it grows better....is there any science to this?